Time and time again we find ourselves back at Snow Lake. At roughly six miles, it is a manageable day hike and there is always the option of adding on a few more miles by going onto Gem Lake. Although the trail is often busy, many people do not take the extra time to head down to the lake. As a result, we often enjoy the place to ourselves with a picnic on Snow Lake's rocky shore and even sometimes a quick dip in the lake on the hottest of Summer days. Wildflowers dot the trail and mountain peaks and gorgeous vistas are in our constant view. I love how hiking is teaching Jasper how to feel confident with his body. 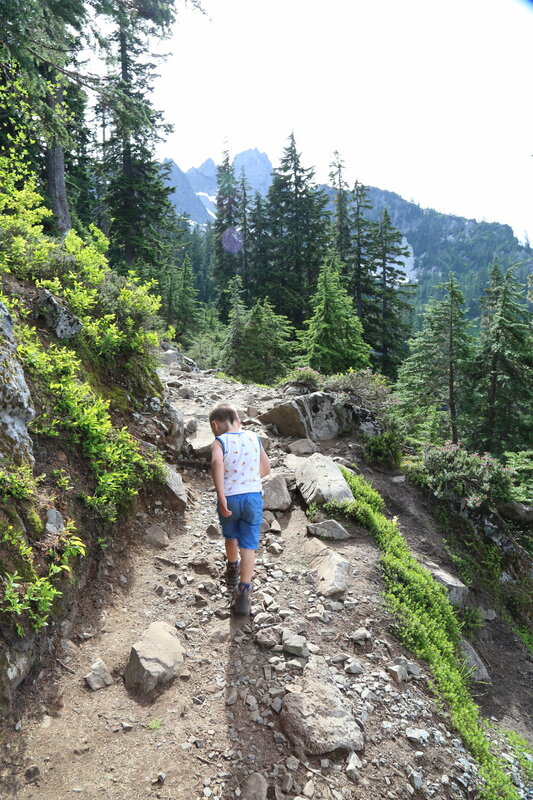 He has learned how to navigate over rocks, practice his balance by walking over streams and strengthening his legs by going up and down lots and lots of switchbacks. And whenever he comes across a "tricky part" he knows he can simply reach out his hand and that we are there to help him. In thinking about it further, this is really my philosophy of parenting. Build his confidence through practice and be there for when he wants my help. There is nothing quite like a pristine alpine lake. The perfect spot for a picnic. I think these are called Tiger Lilies, these are some of my favorite on this trail. Hiking poles are probably one of Jasper's favorite thing about hiking. I love seeing how he has learned to use them properly. One of my favorite parts of Summer is being up in the mountains in early evening as the sun sinks down lower and lower and filters it way through the trees. In the end, we always finish the day dusty, dirty, tired and happy which is the perfect end to a Summer day. From Seattle, drive east on I-90 to exit 52, signed for Snoqualmie Pass West. Turn left (north), crossing under the freeway. Take the second right, traveling 1.3 miles to the end of the road at the Alpental Ski Area parking lot.